magazine Classic November 1922, page 66.
Who was Henry B. Walthall? Note: I spent a lot of time and care writing this biography and tried to reference every source I used so, if any visitor finds a use for any of the information here or on the other pages of this site, please note this source. Thank you, M.W. One hesitates to begin a biography of Henry B. Walthall with a description of his famous role in the 1915 film The Birth of a Nation. 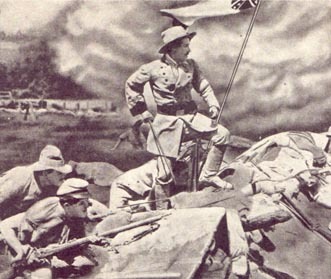 Nearly every article found on Walthall introduces the actor as the "Little Colonel"--hero of the D.W. Griffith masterpiece. Walthall once remarked in a 1929 interview, "I've been trying to live down that picture ever since it was made," and continuing, "It's beautiful, but I'm sick of it" (Hayden). Silent film historian Anthony Slide began Walthall's biographical entry with the statement, "There is no other player from the silent era so closely associated with one screen role than Henry B. Walthall" (Slide II, pg. 401). "Charge!!!" Col. Ben Cameron leading an attack on the Union Army. As much as Walthall did not want to be identified as one character in a 27-year acting career, his role as Colonel Ben Cameron assured his place in film history. D.W. Griffith, the Kentucky-born director, had an ambition to produce and direct the greatest motion picture ever made around Thomas Dixon's novel and play The Clansman; a history of the Civil War and Reconstruction told from the South's point of view. Griffith chose for his leading man another southerner, Henry B. Walthall. In the film, Ben Cameron, with the dark, curly hair and bushy mustache, leads the Confederate troops in a vicious battle against the Union forces, eventually to be wounded and pulled into the Union trench by his northern friend. Providing one of the most memorable scenes in motion picture history, Cameron returns to his war-torn home to be greeted by his sister, who has sewn cotton onto her dress in the hopes of uplifting his southern spirits, and the outstretched arms of his mother. In the Reconstruction part of the epic, a furious Cameron, frustrated by the corruption caused by northern politicians and freed slaves, founds the Ku Klux Klan to, as President Woodrow Wilson (another southerner) is quoted in the film's subtitles, "protect the Southern Country." Although the Klan was seen more as a patriotic cause rather than as the racist and terrorist organization it is seen as today, the film was still emotionally explosive and politically inflammatory upon its release. According to the American Movie Classics 1999 documentary "Censored," The Birth of a Nation has been "banned more than any other film in motion picture history. Its right to be seen has been challenged in over 100 cases, one as recently as 1980." Due to the controversy surrounding the film, not to mention the brilliant fighting scenes and the subtle yet emotionally manipulative acting, Walthall's most memorable role is almost certain to remain in print for decades (and maybe centuries) to come. It is #44 on the American Film Institute's 100 Films of the Century (the oldest picture on the list and one of only two silent films). Film historical societies, festivals, not to mention college courses in film and history (the latter of which introduced this writer to The Birth of a Nation and to Henry B. Walthall) will no doubt keep showing Walthall in the prime of his career to future generations who probably would never have seen or have heard of him otherwise. Henry Brazeale Walthall was born on March 16, 1878 on a plantation near Shelby County, Alabama, sharing with D.W. Griffith a chivalric southern culture and tradition but enjoying perhaps a more affluent family life than the director (Slide II, pg. 401). He was one of eight Walthall children. Henry's father, Junius Leigh Walthall, was a Virginia native who served as captain in the Confederate Army and, later, became a highly respected figure in Alabama politics (Williamson, pp. 83-84). His middle name, Brazeale, was passed on from his grandmother Eliza's Irish maiden name. "The Early Days of Henry B. Walthall,"
Picture-Play Magazine August 1916, pg. 86. Although the Walthalls hoped to make a scientific farmer or lawyer out of their intelligent son, as childhood chum Edwin Williamson recounts, "the boy's talents were of a different nature." Henry was often found under a shade tree reading the works of Poe when he was supposed to be looking after the farmhands or, on one occasion when ten years old, staging a Wild West show in the pigpen (pp. 84-85). Walthall developed an early fondness for entertaining, reciting poetry his mother taught him and, later, playing the mandolin with a group of musicians as they serenaded the young ladies (pp. 83, 87). The handsome young Henry definitely had his share of female admirers. As a schoolboy, he once carved in his desk the initials "H.B.W.--A.T.G." His schoolmates were curious as to who this sweetheart with the initials A.T.G. could be. Finally, Henry admitted that "A.T.G." stood for "all the girls" (pg. 89). Henry's last surviving brother Wales recounted his famous sibling's local success in theatre: "Henry produced The Merchant of Venice with homespun talent. We did the trial scene and I had a small part as the friend of the Merchant. Henry, of course, played Shylock...We played schoolhouses in Shelby [Alabama] and other country towns to capacity business. Our patron were the elite, and some of them had seen Edwin Booth as Shylock. After several weeks' travel by wagon and buggy we closed with a profit" (Griggs, pg. 122). The schoolhouse in Selma, Alabama where Henry packed them in. From the article "The Early Days of Henry B. Walthall,"
Picture-Play Magazine August 1916, pg. 85. Although Henry Walthall was not fated to live the plantation life, he seemed to have fond memories of his childhood in Alabama. Besides entertaining, he enjoyed swimming, fishing, hunting and was an excellent horseman (a talent that would come in handy in his film career). His prowess as a marksman is well-documented, and duck hunting remained a favorite hobby. One story describes a young Henry slaying a rare wild goose and with much pride promising the neighbors a feast on the big, fat bird for the next day only discovering that his mother had sent the goose to the wife of the local clergyman. Thereafter, Henry developed a dislike for ministers (ironically, Walthall would play the role of many a minister in his motion picture career) (McGaffey, pg. 102). This episode certainly did not discourage his love for his southern roots. In one interview, Walthall remarked that he hoped to return to the place of his childhood once he retired (Willis, pg. 55). At twenty, Walthall enlisted in the First Alabama Regiment with the United States Army at the beginning of the Spanish-American War. Serving eleven months, a bout of malarial fever while in camp at Jacksonville, Florida kept Walthall from the battlefields (Katchmer). To please his parents, he tried his hand at law school at Howard College but, finding it distasteful, dropped out after six months. It was now time for the future "Little Colonel" to leave home to pursue a career in the theatre. To make it in theatre, New York was where Henry B. Walthall had to go. Armed with money borrowed from a neighbor and character references from Alabama governor Joseph F. Johnston and U.S. Senator John Tyler Morgan, Walthall set out to find his calling (Katchmer). He made his New York stage debut in 1901 and was cast in popular southern melodramas (Slide II, pg. 401). Although he progressed in the acting field, things went slowly for the future "Edwin Booth of the Screen." 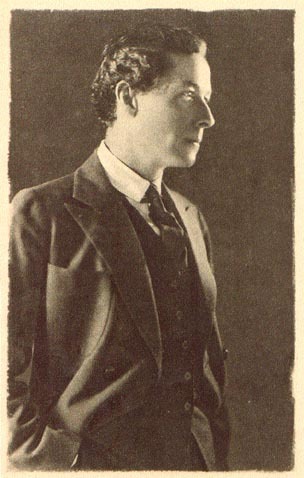 In a 1916 interview, Walthall described his early days in theatre: "I went from Alabama to New York and descended on the city with my hopes and nothing else. New York, like every city, is unkindly to him she doesn't know. And she was characteristic in her treatment of me. I was out of a job and almost out of hope. I found a job as a super in a theatrical company doing small things for small towns. From then on my life went back to stereotype. I was an actor working up, and working up isn't an interesting thing to anybody but the one who is working" (Ames, pg. 138). But work did get interesting for Walthall. He joined the theatrical company of Henry Miller and Margaret Anglin which provided several seasons of steady employment (Franklin, pg. 240). As part of the cast in The Great Divide, Walthall met fellow cast member James Kirkwood. This friendship soon introduced Walthall to a new medium in which to showcase his talents. Click here to continue the biography with "The D.W. Griffith Years." Please see the Bibliography pages for details on the references used in this biography.